Joachim Oster remembers his happy, but poor grandfathers working in the vinyards of the river Moselle and tilling the soil behind big draft horses in the Eifel and Ardennes. Meet Joachim, the brains, hands, and pretty much anything in between of Athena of Hawaii. A plantation set up as a ‘boutique’ Hawaiian Kona coffee farm and retailer, without compromising the traditional family farm structure. Please explain you day-to-day role at Athena of Hawaii. 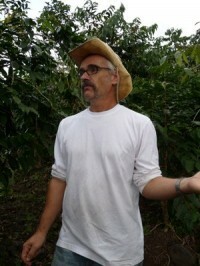 Tree care, soil conservation, processing of coffee from fruit to roasted, packaged and shipped product. Website maintenance and information upkeep, promotions, design & advertising, customer correspondence, finances & book keeping. Having a balanced interaction with the ‘dynamic’ needs of a family who constitutes also the work force, means taking care of healthcare, school, shopping, banking. Which makes it sometimes easy and sometimes more difficult than dealing with a salaried work force. Advantage is that the ‘corporate outing’ is a drive down to the beach. And the ‘labor negotiations’ result in an increase of the kids allowance. No law suits though. How did you arrive at ATHENA of HAWAII? I had the advantage of growing up in a European farmer and vintner community. And then to work in the design and corporate world of Manhattan for many years. To combine these two worlds we as a family wanted to ‘own’ a value added farming product and have a safe, sane place to raise the kids. Unbeknownst to many Americans Kona coffee is next to Napa wine the country’s top gourmet agricultural product. The USA is mostly famous to produce “edible substances” like twinkies, ketchup, cheese in a tube. Only recently they start to recognize that nutritional value, taste, health benefits are a way to captialize on emerging trends for better food. That trend is not going anywhere but up. Did you work at any other companies before ATHENA of HAWAII and what was you role at these firms? Most titles I held were called “Art or Creative Director”, either at fashion companies like PRADA or advertising companies like Ogilvy & Mather. While I saw the overall democratization of design (MacIntosh computers, Photoshop, Martha Stewart, hobby crafts, e.g.) we designers had to learn more of the corporate structures (planning, strategy, consumer behaviors, e.g.) to survive as a species. Design is now more of a corporate function than it was 20 years ago when I started out. Not much fun though anymore, just look at the boring cars the last decades produced. What previous personal experience has best helped you deal with the challenges at ATHENA of HAWAII? Never owing a dime to anybody. No biz loans, no mortgages. My corporate jobs were easy, because I always had my F...Y... money in my account and didn’t have to let fear or greed blur my judgement. Same when you own the farm and land: You are free to make mistakes and learn on your own account. What drove you into this line of business? To have real dirt under my fingernails when typing HTML code. And having a darn good cup of coffee next to me- better and cheaper than Starbucks. What is your biggest challenge at ATHENA of HAWAII? And how do you attempt to surpass it? To keep the family healthy to do the demanding physical labor for the next few years till our market is fully established. To hire labor we would have to raise prices which we only want to do once a larger customer base is established. Or when we are getting too old to work as much. Secondary is the fight for regional name protection on a state and federal level. The USA is held captive by processors who abuse their geographic identities like in the old days gold and oil was plundered: Champagne and Burgundy wine and Kobe beef are protected by their countries. But anybody can call their foreign coffee beans ‘Kona coffee’ outside of the state of Hawaii. Best action plan is to show the local struggling government what source of income they lose by listening to lobbyists versus trademarking their regional names with the USPTO and WIPO. Who's ATHENA of HAWAII ? Set up as a ‘boutique’ gourmet coffee farm and retailer, without compromising the traditional family farm structure. That means low labor costs (family works on the land, lives on the land, is unpaid for actual labor). If intensive farm labor is needed, it is contracted out on an hourly base. This limits corporate growth in the traditional sense, but that also makes it genuine for the highly educated customer who justifies the greater price of the product. One part of ‘payment’ is the high quality of living in the natural Hawaiian environment. Which in turn nurtures the image of the brand. Cutting out the wholesale level allows to compete at a high profit margin for a quality product at a lower price point. What makes ATHENA of HAWAII different? There are untold retailers in the mainland USA who whatever Kona coffee they sell is not monitored by the US government. In Hawaii are about 700+ Kona coffee farms, which range from the large offshore corporation to the day laborer with a few trees in the back yard to the retiree gentleman farmer who doesn’t know what he’s actually growing but it’s lowering his tax bracket. Many fake to be a genuine family farm, or if they truely are, they often don’t reach the end customer. We try to be as genuine as possible and talk about it. We don’t try to bring production costs down where quality is compromised. Processing coffee is a slow act. Machine use and pesticide usage raise the profit margin, but interrupt biological processes, hence sacrificing taste. We see the ecological sustainability of agriculture as closely interwoven to its longterm profits. In our case, it makes the coffee simply taste superior and sells better. It’s as easy as that. Single estate, single origin roasted and green 100% Kona coffee. Certified and inspected by the USDA. Handpicked, fermented, sundried. Roasted upon order and shipped farm direct. Who are ATHENA of HAWAII customers? Either gourmet coffee drinkers or former Hawaii tourists who encountered Kona coffee by visiting Hawaii. 80% direct customers, 10% retail, 5% roasters, 5% corporate buyers and event planners. Some college, college education. 60% female, 40% male, 50% suburban, 30% urban, 20% rural. Age range 35+ years. Beginning of 2004, right when we bought the farm. Wanted to have the website and web store ready because there was plenty of work to be done on the buildings and orchard itself. And getting the initial web setup out of the way helped greatly. It is also underestimated how much the well planned architecture of an e-commerce site can shape a business plan: Inevitably it forces you to make projections and calculations along the way. Without internet presence farming in Hawaii simply doesn’t work. It is the remotest island group in the world with high labor, housing costs, living expenses. Most food is imported to the surprise of many. The local market alone can’t sustain agriculture. The value added, exported agricultural product needs an online shop with constantly updated information about why it is special.